It can present a serious worry in very young, very old or immune compromised dogs. If your dog falls into this category contact your vet immediately. Be sure to tell the receptionist that you suspect kennel cough as they may require you to use a different entrance/waiting room or even to assess your dog in your car in order to prevent infecting other dogs at their practice. 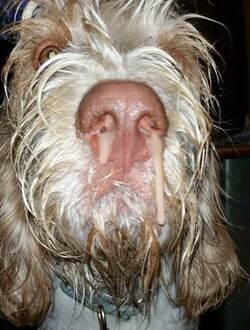 In the event that your dog presents with kennel cough and is showing signs of listlessness, loss of appetite and/or fever it may be that there is an underlying pneumococcal infection that will require immediate veterinary evaluation and treatment with antibiotics. Nasal discharge should be investigated by a vet too. Vaccination against Kennel cough is available from your veterinary surgery. There is no guarantee however that it will prevent infection. Kennel Cough is localised to the respiratory tract which does not lend it to prevention by vaccination, and also the virus which causes it mutates so rapidly that it is hard for the vaccine to keep pace with it. The initial vaccination requires regular boosting and even then there is no guarantee it will completely prevent it. It will however, limit the symptoms somewhat so that infection is less severe/long-lived if the dog catches it. Some boarding kennels, puppy classes and training classes will require your dog to have the vaccination before attending. In this case you will have to have the vaccine administered at least 5 days beforehand in order for it to activate. As the infection is self-limiting no treatment is actually required. Some relief from the cough can, however, be obtained by administering a children's Tickly Cough Linctus using the dosage for a 12 year old child, or using Manuka honey. If the infection is complicated by pneumonia, or your dog is young, old or immune-comprised, seek veterinary advice immediately as antibiotic treatment will be required. Quarantine times vary from practice to practice but the most common time given is 2 weeks after the last cough. It is vitally important that your dog not be allowed to mix with dogs that are very young, very old or ill at all whilst they are contagious. They should also be quarantined from persons who have poor immune function as the bordatella pertussis (whooping cough virus) is closely related. They should be kept away from all dogs and areas that are frequented by dogs whilst the cough is prevalent, and avoid mixing with dogs for 2 weeks afterwards, although it should be OK to leash walk them during this time.